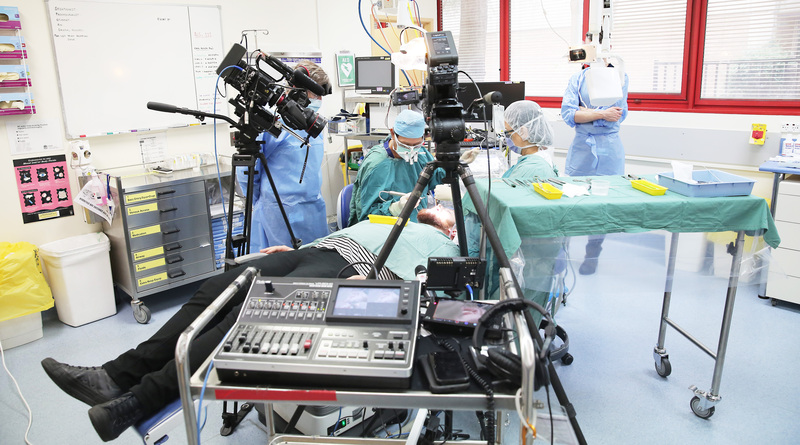 Behind-the-scenes filming takes place as vision is broadcast to dental students. Dental students at Westmead Hospital have participated in their first live surgical training session. The session allowed University of Sydney students to learn and observe as they watched as-it-happens demonstrations performed by senior clinicians. The training was supported by Western Sydney Local Health District’s multimedia team, which involved a complex set-up of cameras and technology to facilitate the session. The broadcast was completely wireless, in real-time and in high definition. Approximately 15 students were in a room nearby as the surgical demonstration took place. Westmead Hospital’s Centre for Oral Health director Josephine Kenny said this method of teaching and technology is not new to dental education, however it was the first time the University of Sydney implemented this style of teaching at Westmead Hospital. “The students are enrolled in the Graduate Diploma in Clinical Dentistry Oral Implant Program to educate them about surgical and restorative phases of oral implants. “This includes replacing one or more missing teeth as well as those patients who are missing all their teeth. ← Is gambling a problem for someone you love?